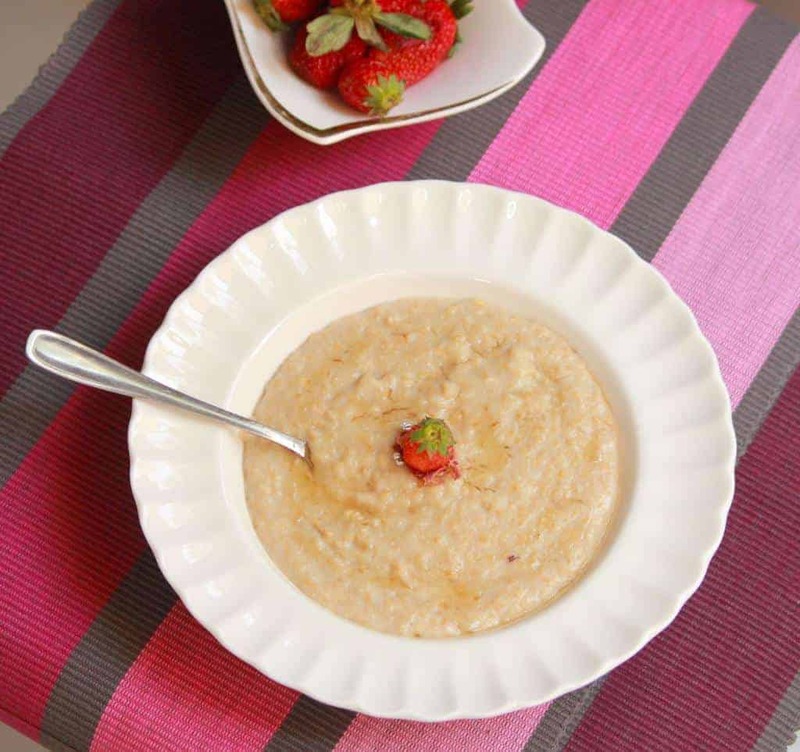 A simple, delicious oatmeal porridge flavoured with rose petals and honey. It’s fragrant and will really transport you to a happier time! Takes about 10 minutes to make and it’s the perfect breakfast on the go! With the new year, come new hopes, expectations from oneself and resolutions! But how often do we stick by them without faltering? ‘Losing weight and getting fit’ tops Time Magazine‘s list of new year resolutions made and broken. Ha! Don’t we all relate to that one so much? But then, don’t we also decide to try one more time? Just between you and me, I must have made and broken this resolution at least five hundred and sixty seven times – if you count every second week of the year. So hard to resist that jar of Nutella and a good cheat meal, which happens ever so often, isn’t it? So yet again, let’s give it one more shot. I started the year with this breakfast dish that is so versatile and can be made with many flavor combinations. My favorite is using rose, cardamom and honey to elevate the humble oats to an almost dessert like quality which leaves me asking for another helping. Oats are very easily available and flexible because they can be enjoyed with a variety of ingredients, depending on whether you’re in the mood for something sweet or savoury. The sweeter version is famous among children, partly because of the story of Goldilocks and the 3 bears but mostly because of its comforting and homely taste. But there is a child inside us all, isn’t there? A well cooked porridge has the power to make all of our mouths water. Here is my take on this widely favoured dish with a dash of roses for the love of it! 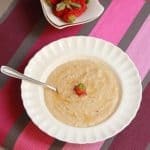 A simple, delicious oatmeal porridge flavoured with rose petals and honey. 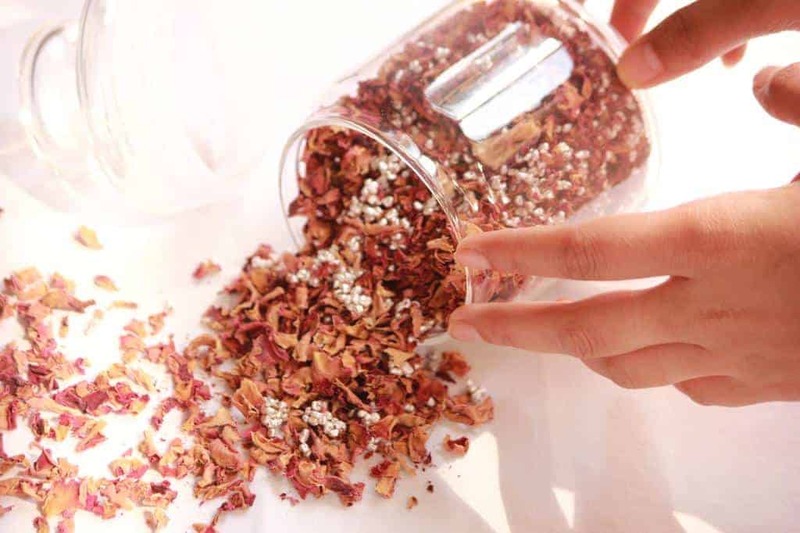 Its fragrant and will really transport you to a happier time! Takes about 10 minutes to make and is the perfect breakfast on the go! Add rose petals and cardamom pods to milk and slowly bring to a simmer. Avoid bringing to a boil quickly so that the flavors permeate the milk. I used 2% skim milk, but feel free to use any kind. Strain the milk and discard the rose petals and cardamom pods. In the same vessel, add oats, honey and the milk and cook for 3-4 minutes, adjusting its consistency to suit you. Add more milk to thin the porridge if you like. 1/4-1/2 cup will not alter the taste.